Captain Billy Godleman, who says he is hopeful Derbyshire can have a successful campaign in the Royal London One-Day Cup. 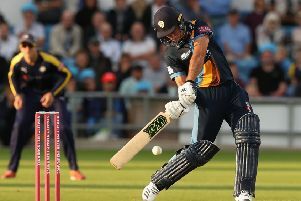 Billy Godleman described Derbyshire’s defeat to Durham as a “tough one to swallow” given the start the visitors made to the Specsavers County Championship Division Two match at Emirates Riverside. Needing 203 runs to win with six wickets remaining at the start of the final day, Derbyshire were undone by a fine morning’s work by Chris Rushworth who led the way with the ball in hand with figures of 5-47. Derbyshire had bowled Durham out for 96 in their first innings and were in sight of victory on day two when they had Durham six down, with a lead of only 46, but a maiden first-class century from Gareth Harte turned the game on its head. They lost by 95 runs.